How fast 2011 is closing to an end! It’s been a really wonderful year for me personally and creatively. I’m so thankful to my blog readers and paper crafting friends for supporting me and inspiring me. I’m looking forward to another great year together in 2012. Below is a card I made earlier this year while guest designing for Birds of a Feather Kit Co. 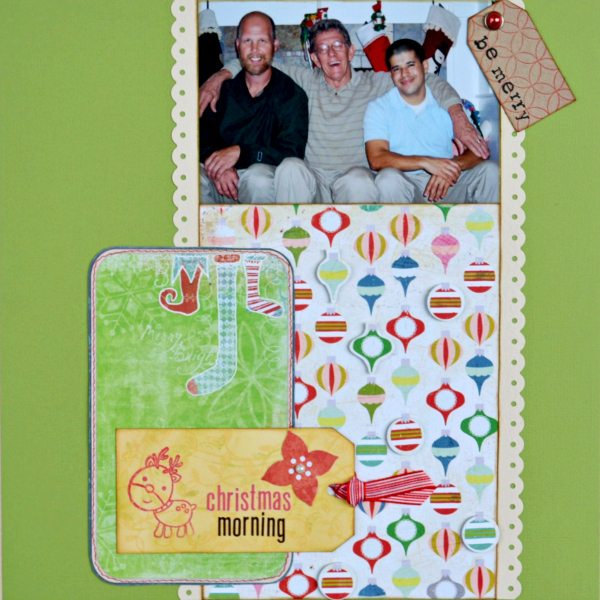 I used the July kit which was packed with goodies from October Afternoon and Cosmo Cricket. The script letter stickers are Webster's Pages. 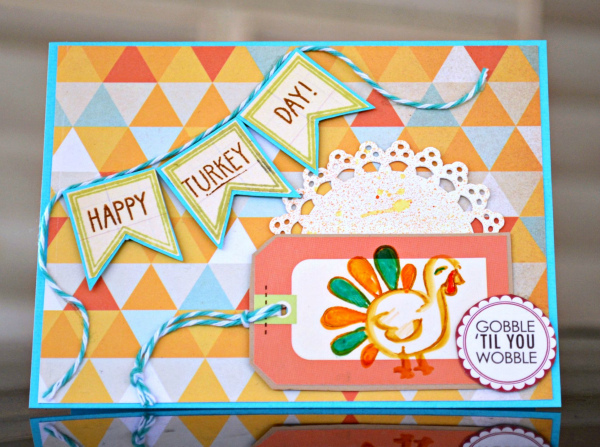 You can find Birds of a Feather kits here. 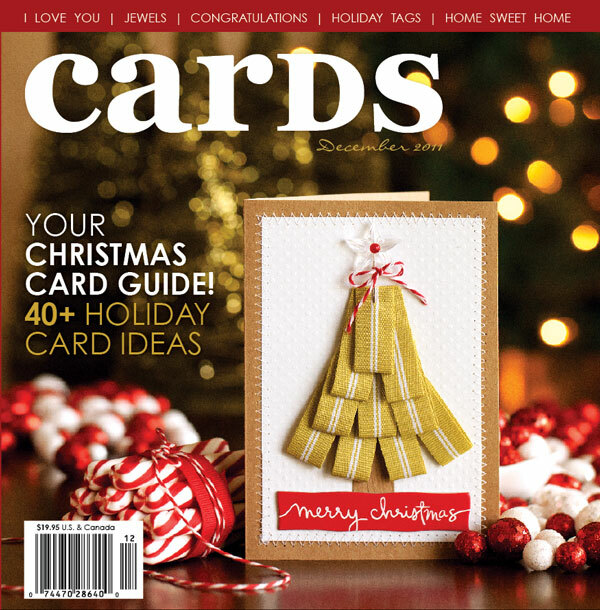 I was really excited when Cards Magazine picked this up for publication as a New Year’s card in their December 2011 issue. Happy New Year, everyone. Wishing you the very best in 2012. 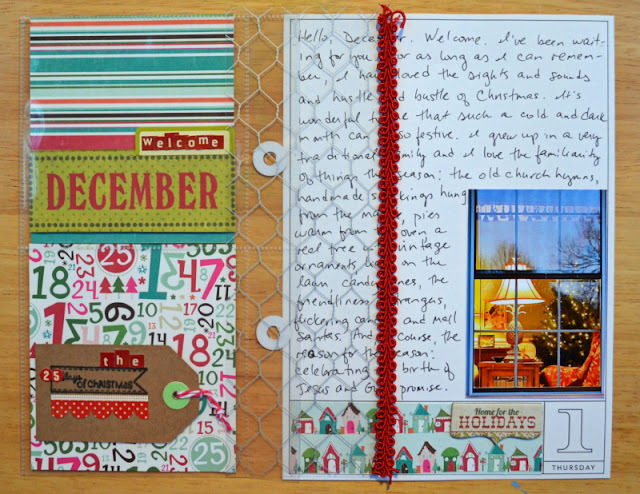 This was my first year doing a December Daily and I had such fun with it. I ordered the Studio Calico kit. 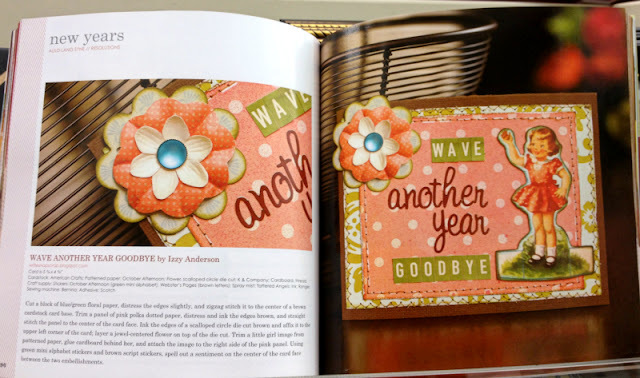 I so loved the American Crafts album that came in the kit. It is a great size. The pages are 6 x 8.5 inches. I almost always scrap 12 x 12 and it was such a treat to work on the small canvas of the December Daily. I used the calendar pages that Ali Edwards offers and followed her general framework. I used her calendar pages on the right and a foundation page on the left. I stitched around the foundation pages to mimic the frame of the calendar pages. I used mostly Echo Park throughout the album to give the Daily a cohesive look. 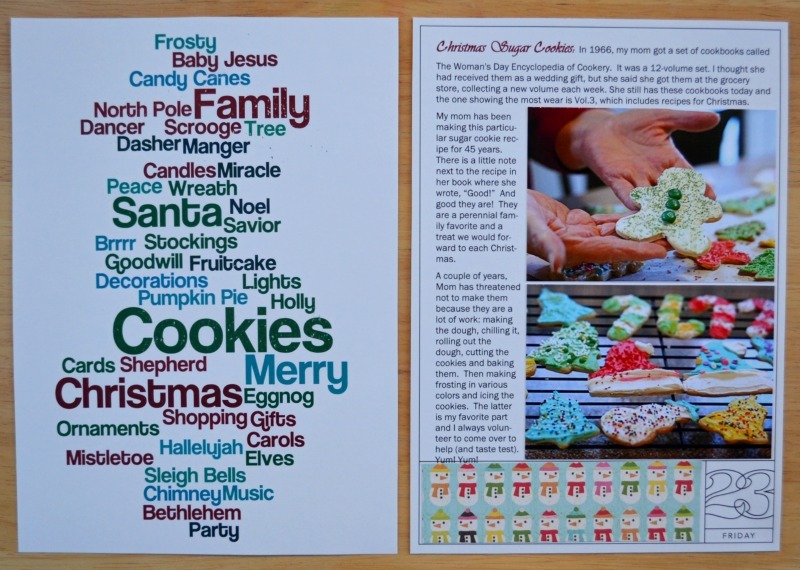 Over the years, we collected crystal Orrefors ornaments for our tree and I highlighted them in this entry, a filler day. One of our city's favorite family-friendly traditions is going to see the Leonard Bearstein Symphony Orchestra, mechanical bears that sing and play holiday songs in the lobby of a building uptown. Mom has been using the same recipe to make these sugar cookies since 1966. It's not Christmas without these cookies. LOVE them! 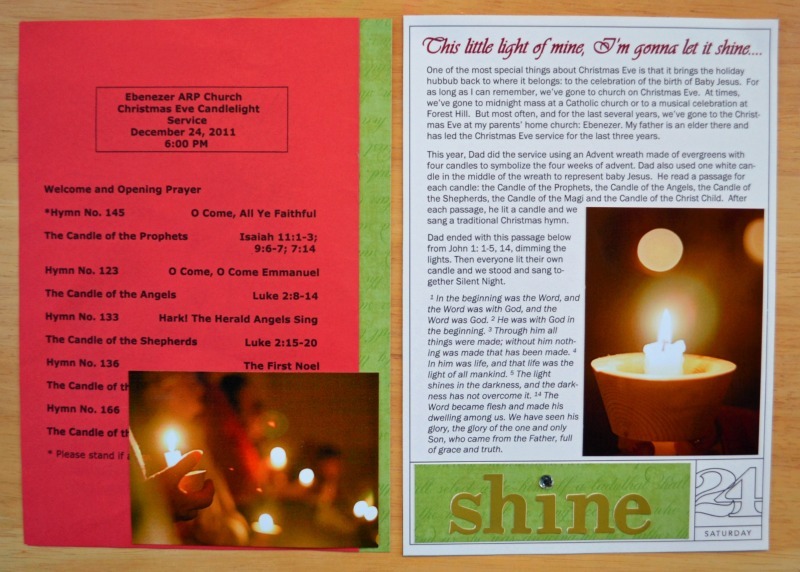 Scenes from the candleight Christmas Eve service and journaling about the tradition. Christmas morning. I especially wanted to include photos of my parents here because they are so special to Cory and I love to observe his relationship with them. I very nearly wrote “The End” at the bottom of the last page. I'm going to tuck my album away with my Christmas decorations. It will be fun to pull it out next year and have a look. I’ve finished my December Daily except for a few pages in the middle. Those last stragglers are the hardest to do, especially on days without holiday activities. 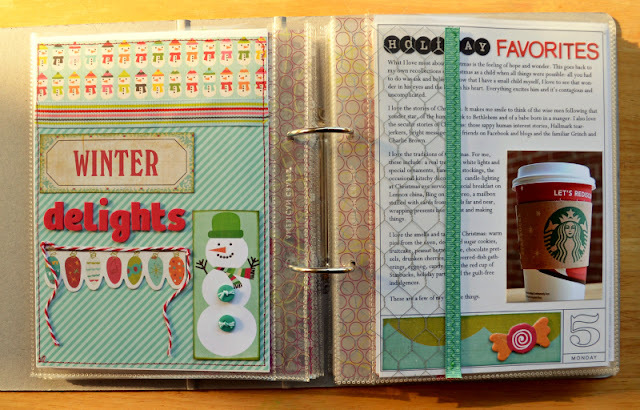 I am going to try to tackle those entries this weekend so I can put my book away and get back to other paper crafting projects. Here are a few more of the early pages of my December Daily. 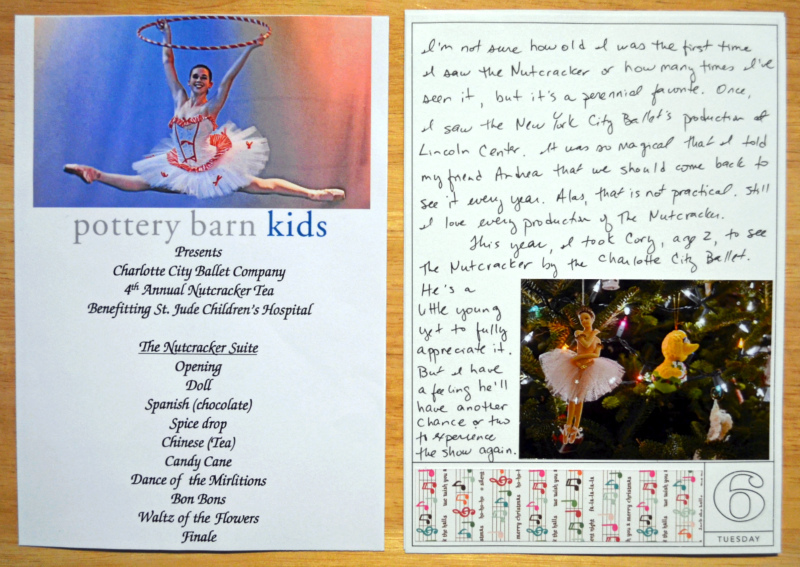 We went to see a special performance of The Nutcracker, benefiting St. Jude’s Children’s Hospital. My son, age 2, is still a bit young to appreciate this show but Mommy enjoyed it. To commemorate the outing, we added a ballerina ornament to the tree, right next to Big Bird! 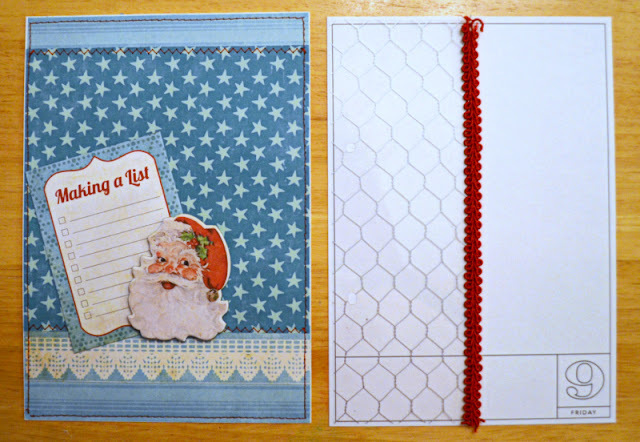 I wanted to add a holiday project to my December Daily. This spread is a bit incomplete. 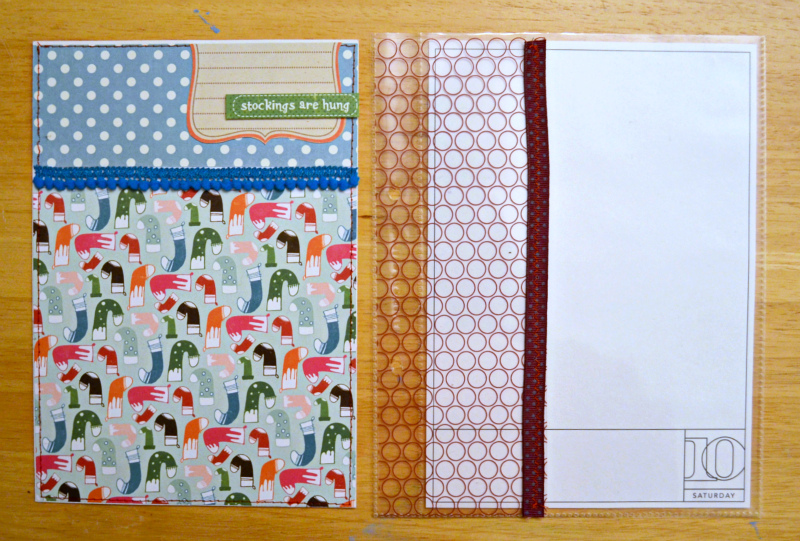 I need to go back to stitch around the patterned paper and add a caption or embellie. On the left is a card I made for the Echo Park Paper blog hop. I will just slip it into the page protector without attaching it to the page. The right side of the spread is a screen shot of my blog entry that day. 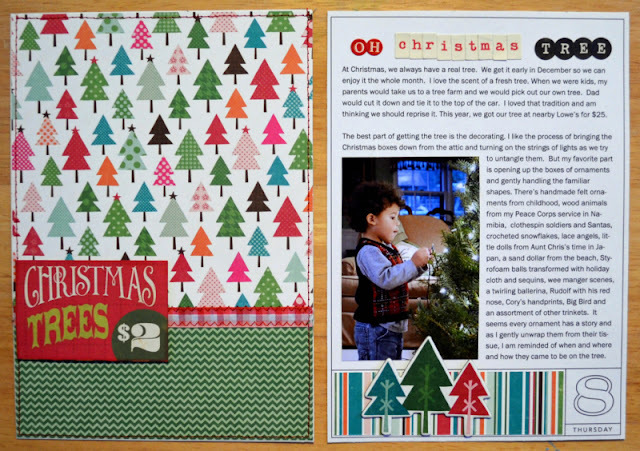 Here I journaled about getting the tree: both this year and in years past. We always buy a fresh tree for the holidays. I love the smell! The tree becomes such a presence in the house. It’s always hard to take it down and put the ornaments away once the holidays are over. I keep the tree up as long as possible. 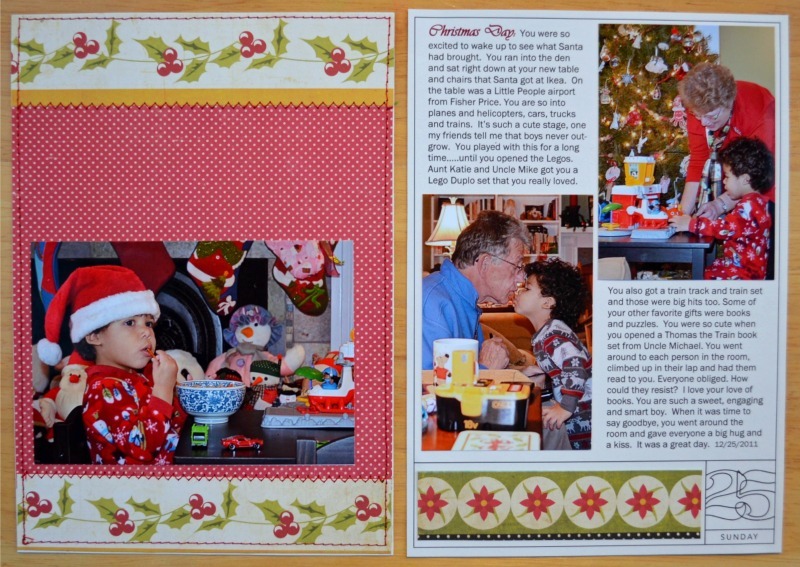 This is a filler day, so I decided to tell the story of an unusual Christmas and memorable gift. 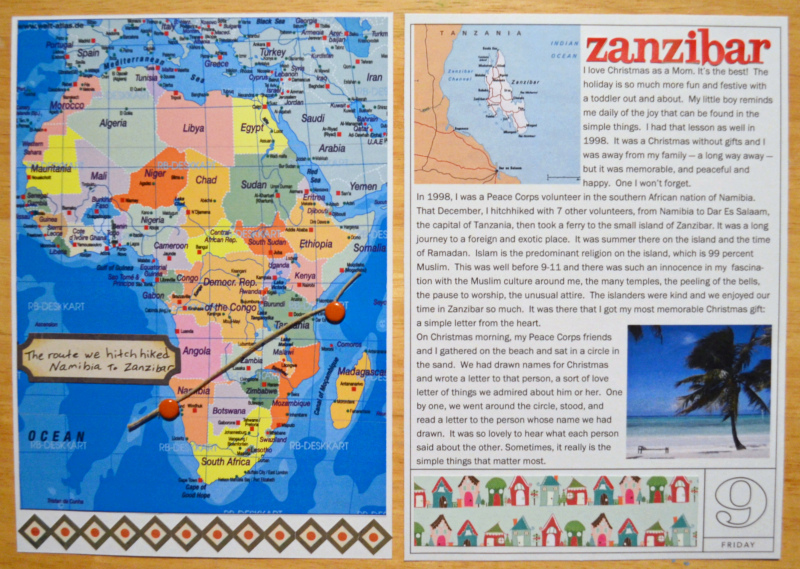 In 1998 while a Peace Corps volunteer in southern Africa, I hitchhiked with friends to Tanzania (several countries north), then took a ferry to the island of Zanzibar. 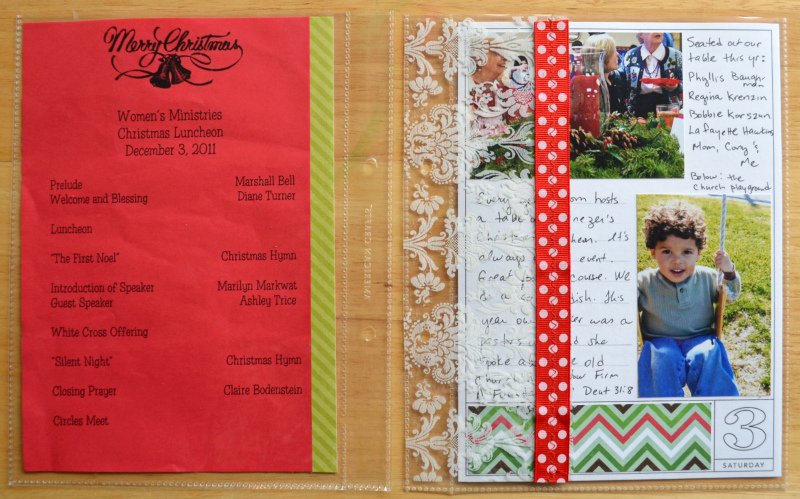 I had no gifts that Christmas but I did get something more meaningful: a special letter. My supply list and earlier December Daily posts can be found here, here, here and here. I’ll be back tomorrow with the last entries of my December Daily. 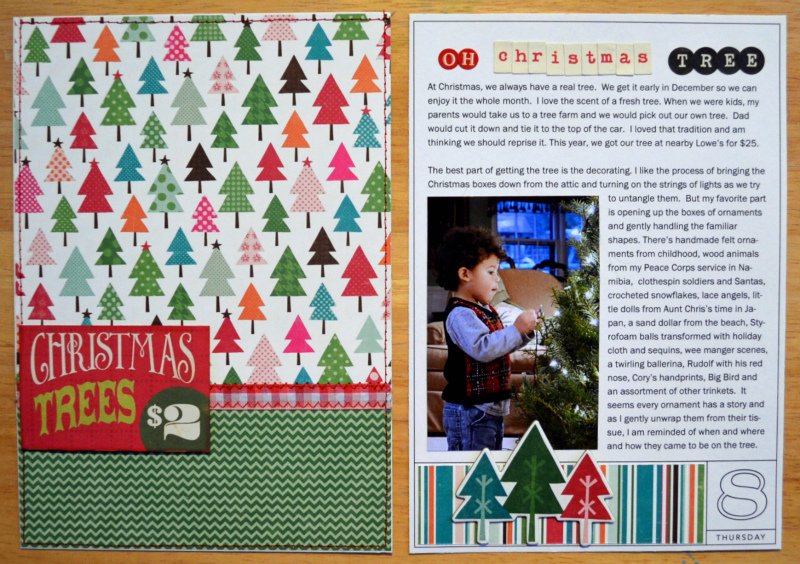 Echo Park Paper gave its in-house team and Fresh Face designers a challenge to make holiday projects with children. My child is 2 so that did present a challenge.... I went old-school and made ornaments using my son’s handprints and footprints. 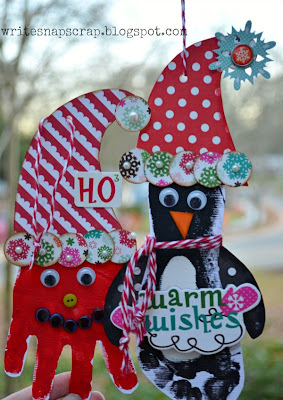 This is an easy and fun project to do, but a bit messy, as it does involve a toddler with paint on his hands and feet. Right before bath time is a good time. Just sayin’. 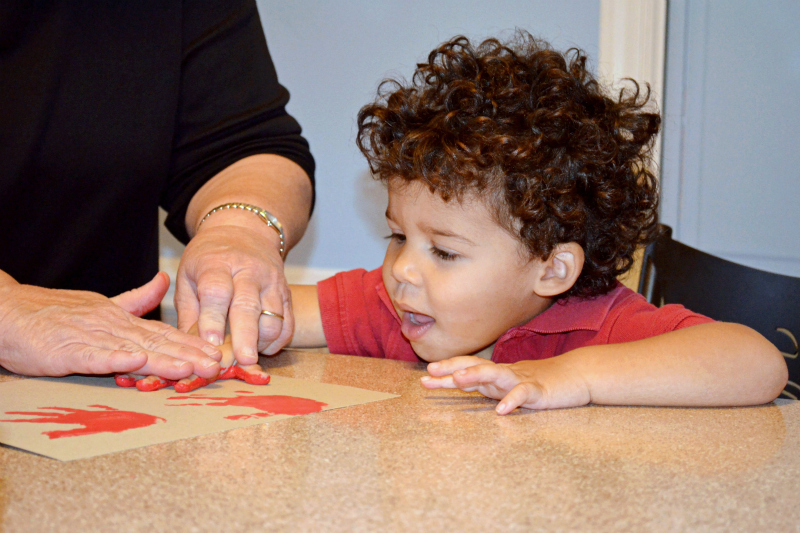 We started with handprints. I enlisted my mom’s help and we painted Cory’s hand with red acrylic paint then stamped his hand on cardstock. We tried both white cardstock and kraft to see which we liked better. 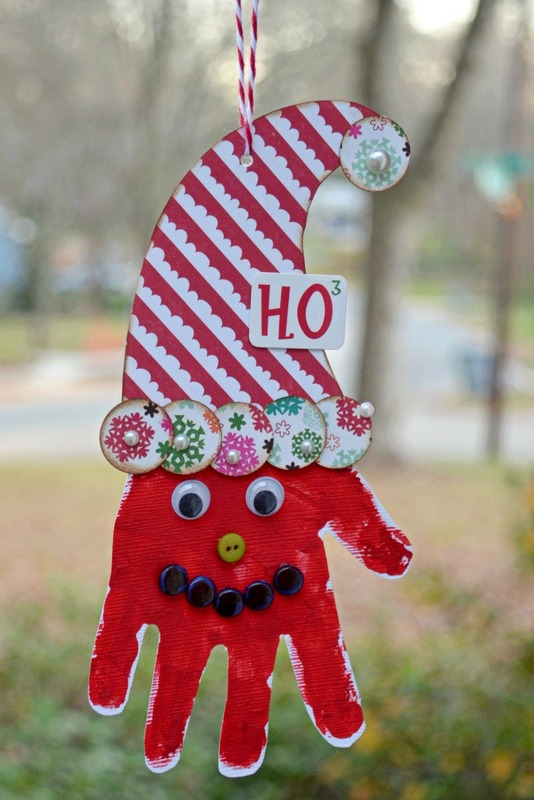 After the handprints dried, I cut them out to form Santa’s face and beard, adding googly eyes, a button nose and a brad smile. I hand-drew a hat from Echo Park paper then used a small circle punch and some adhesive pearls for the trim. We finished the ornament with a “ho ho ho” sticker and a twine hanger. To make the penguin, I painted Cory’s foot with black acrylic paint and stamped his foot on white cardstock. After the black paint dried, Cory used his fingers and some white acrylic paint to give the penguin a belly. 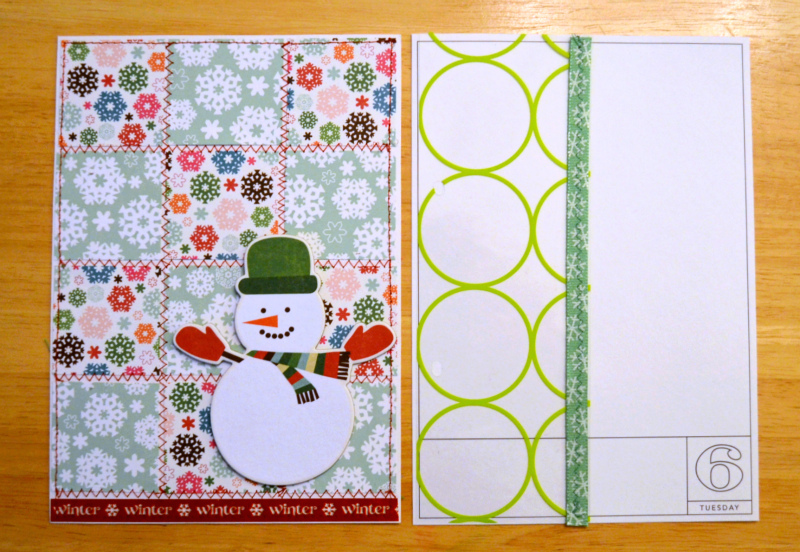 We added arms (flippers) and a hat using Echo Park paper (Metro Dots and Stripes), stickers and brads. 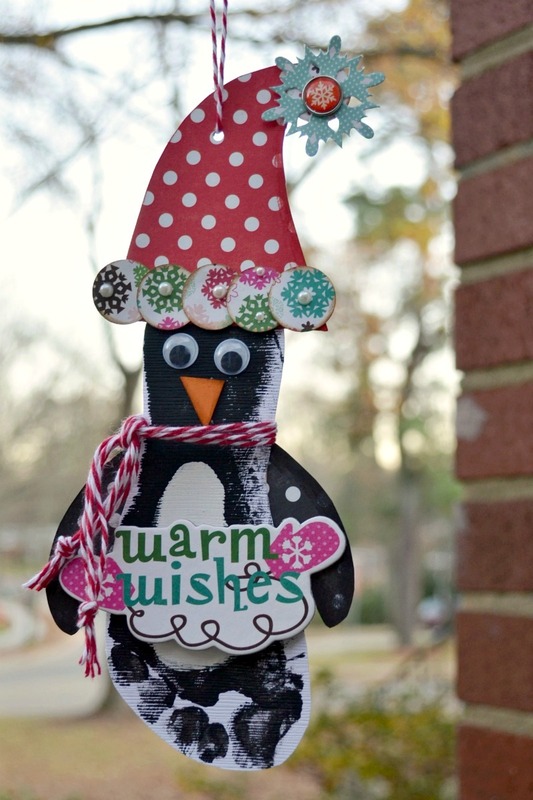 We finished the penguin with a chipboard greeting and a twine scarf. 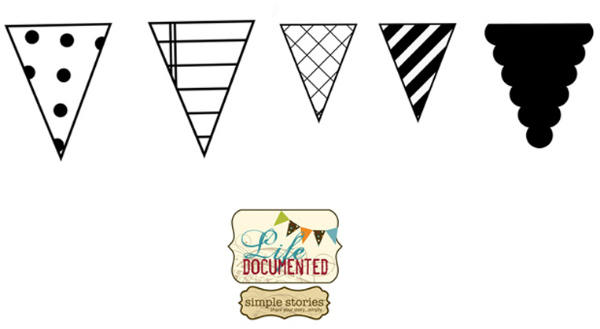 You can find more about this project and other Echo Park projects with kids on the EP blog. I love banners. It's the most fun trend. 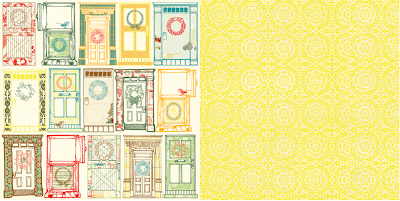 You'll find banners on many of my projects and I have a couple of great banner stamp sets. 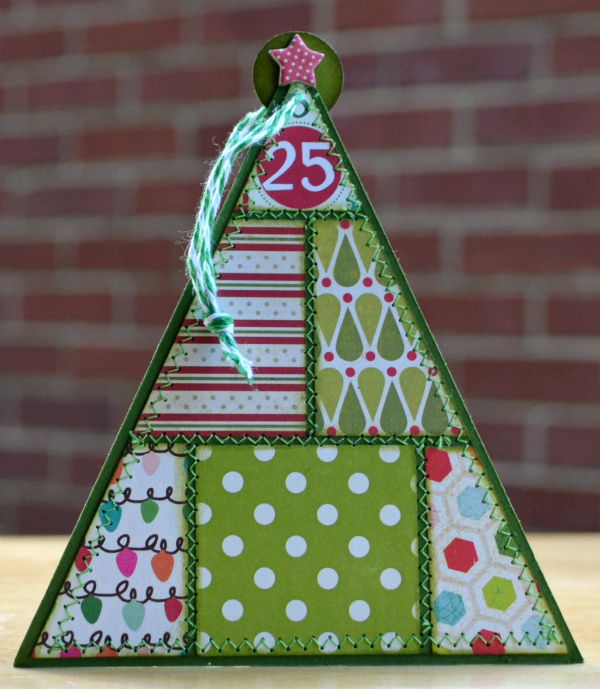 For the holidays, I thought I would repurpose triangle banners for Christmas trees. 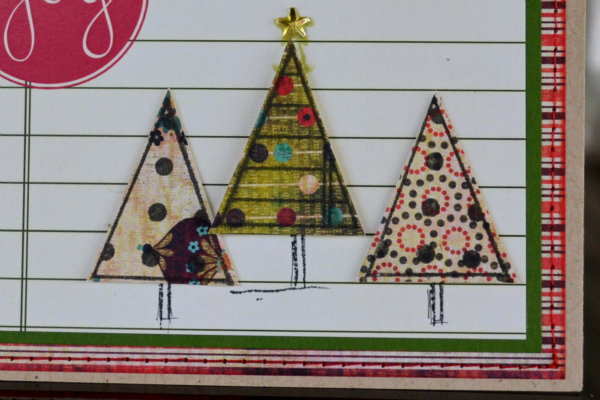 From the set, I used the polka dot banner on the far left and the ledger banner next to it to make these trees. I drew little tree trunks with a black zig. Below is the full card. It was really quick to do. I used a journaling card from Elle's Studio and patterned paper from a 6 x6 holiday pad from Basic Grey. 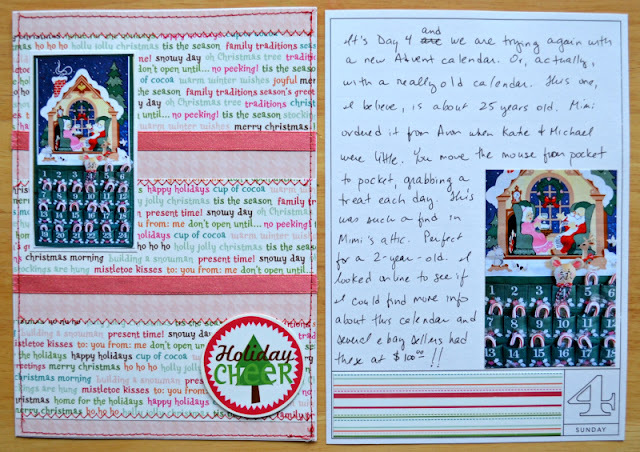 The little stamped greeting at the top is from Fancy Pants. 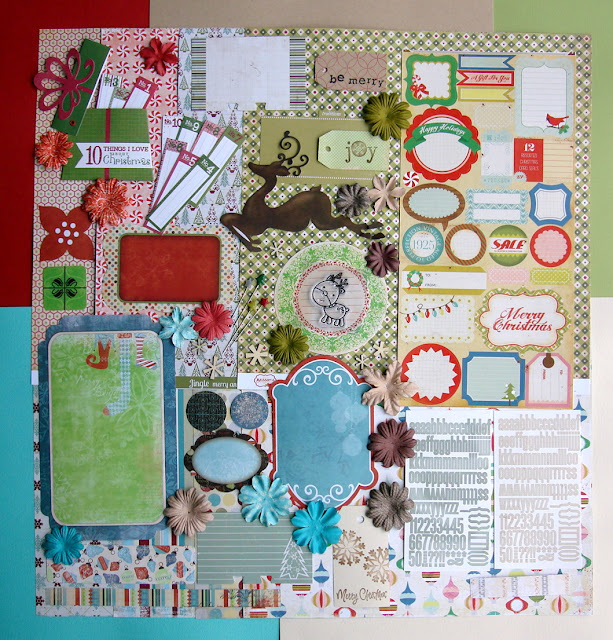 Cardstock is Bazzill kraft. In the hustle and bustle of the holidays, I often find that I don’t scrap Christmas until well after the fact. Does this happen to you? One of the things I meant to document last year, but didn’t, was my son’s favorite Christmas present. Like so many boys his age - and older - he has an obsession with cars. In fact, this may well be a stage that boys never outgrow. Under the tree last year, every present was wrapped except one: the Little People racetrack. My toddler is an early riser and we wanted him to have something special to find while everyone else was still nestled in bed. 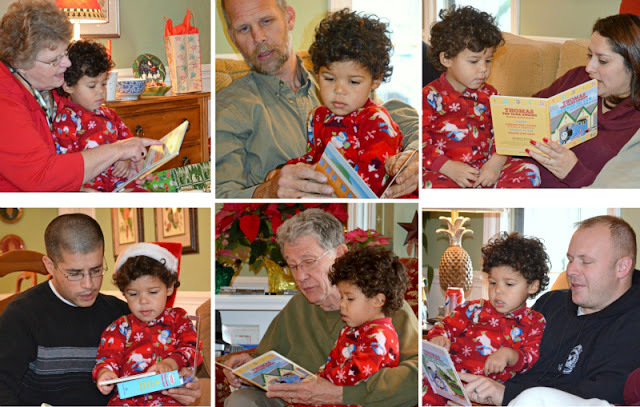 I got up with him at 6 am to see what Santa had brought. Cory couldn’t have been more excited. 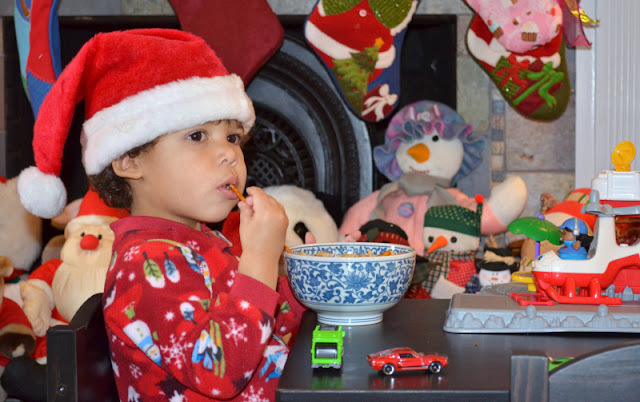 Even later that morning, as he opened present after present, he kept going back to his cars and the racetrack. It was his favorite present. 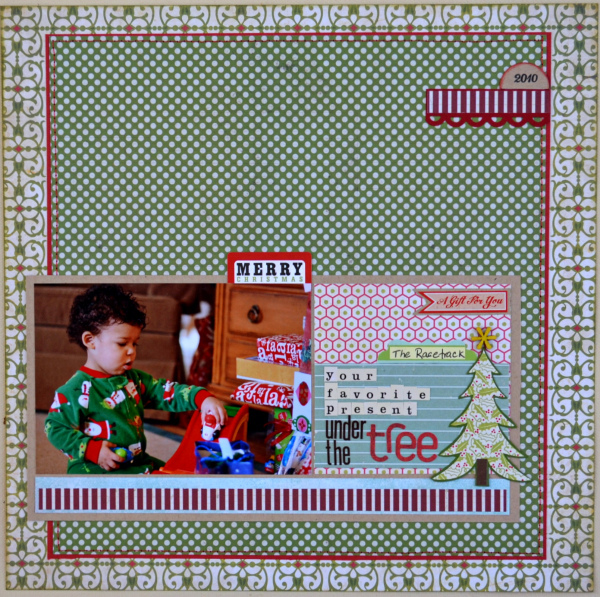 I created this layout with the Scraptastic Club’s December kit: Naughty or Nice. I’ve had such fun this month as guest designer. The kit club is running four challenges this month with a great prize: a collection kit from Crate Paper. You don’t have to use the kit to participate in challenges. You can find the details here. I love making tags. They are such a fun little canvas to work on. 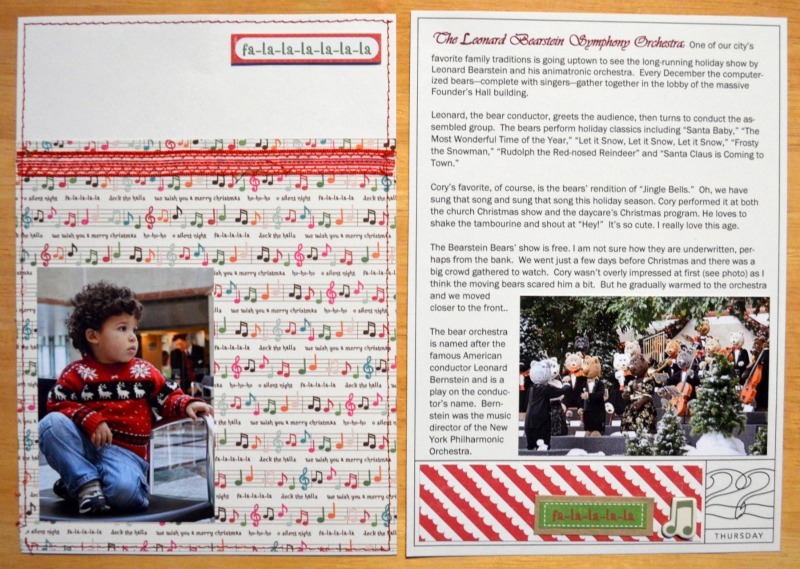 Echo Park Paper asked its in-house team and Fresh Face designers to each make a tag for their blog this Christmas. You can find the blog post here. I had the first day of Christmas and this is the tag I made. 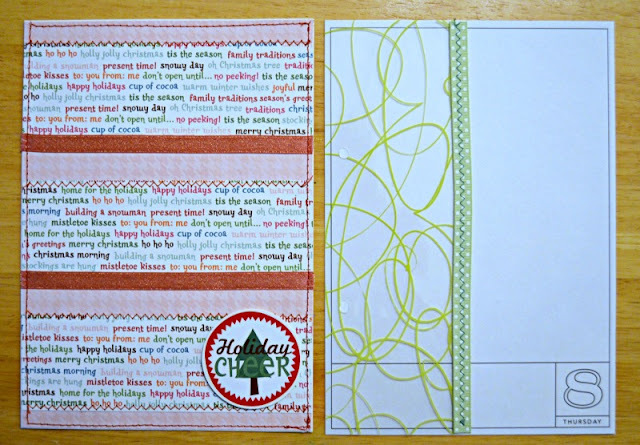 I used the B side of the border strips from EP's Season’s Greetings as my tag base, then added a bit of burlap and a red border sticker. 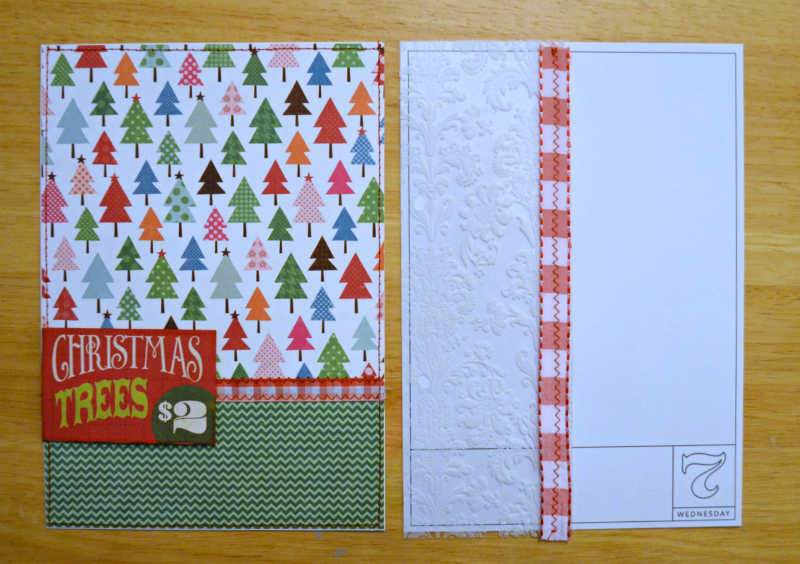 To embellish the tag, I used stickers, brads and pp from the Season's Greetings and Holly Jolly collections. 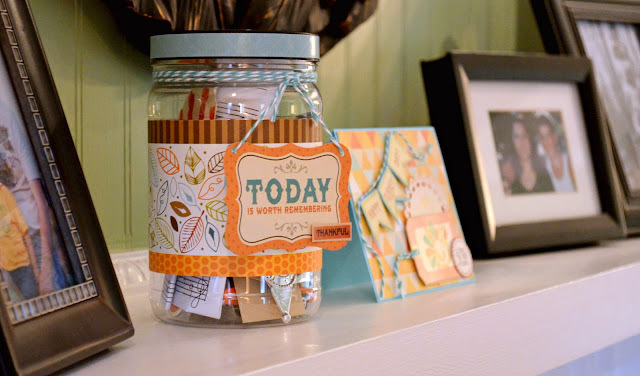 Do you ever see a piece of patterned paper and you know immediately what you will do with it? This happened to me the moment I first saw the Webster's Paper line, Botanical Christmas. Those doors made me swoon. 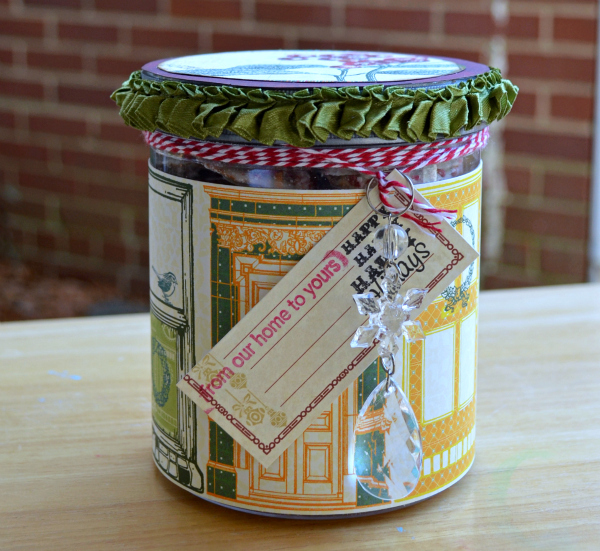 I knew immediately that the Come On In paper would be perfect for a neighbor gift with the theme: from our home to yours. 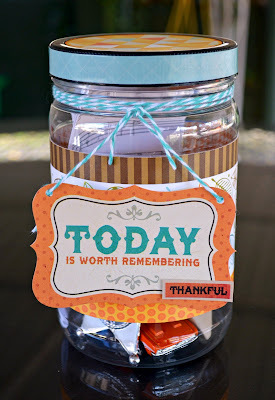 I used the paper to make a treat jar with a coordinating card. In the jar are white chocolate covered pretzels with crushed candy canes on top. Yummy! The jar was so fun to do. I used a jar I had on hand that was just the right size to wrap the patterned paper around. 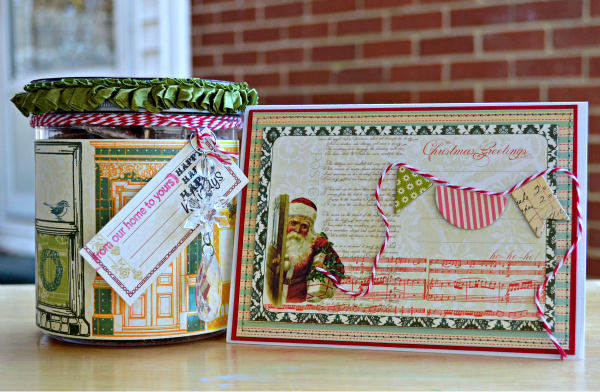 To decorate the lid, I cut a circle from another pp in the Botanical Christmas line and glued it on top of the lid. Around the lid, I used a beautiful green trim that Webster's released last Christmas and a bit of red twine. On a journaling card, I stamped the sentiment "from our home to yours," then hung it and a "crystal" bauble from the row of twine. I can't give a gift without a card, so I used the paper, Postcards To Santa, also from the Botanical Christmas line. 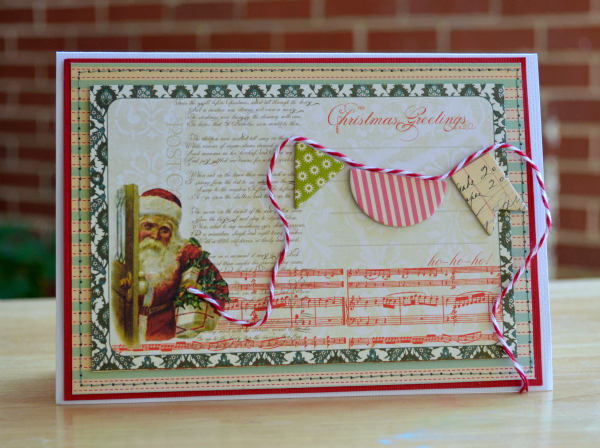 The paper is perfect for card-making. It's so pretty all on its own that I did very little to embellish it. I just cut out a postcard, mounted it to a card base, did a quick stitch around with my sewing machine, and added a cheery chipboard banner and twine. We'll deliver this gift in the afternoon. I think we'll have one happy neighbor! 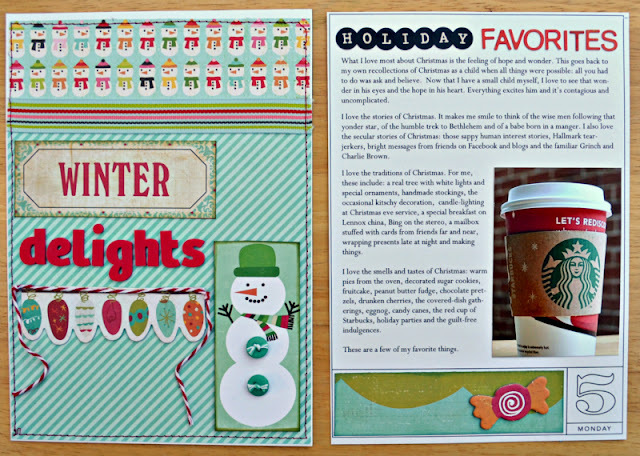 Welcome to the Echo Park Paper "Holly Jolly Holidays" Blog Hop! 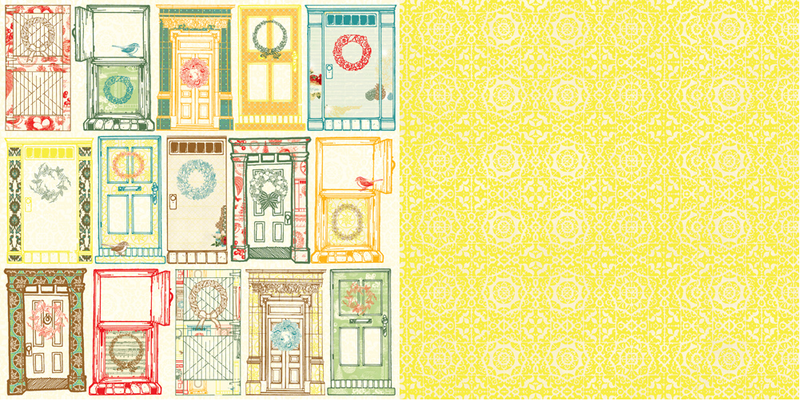 We've created a special one-day blog hop event in which you can hop from one designer's blog to the next, viewing beautiful holiday cards. Here's the card I created. 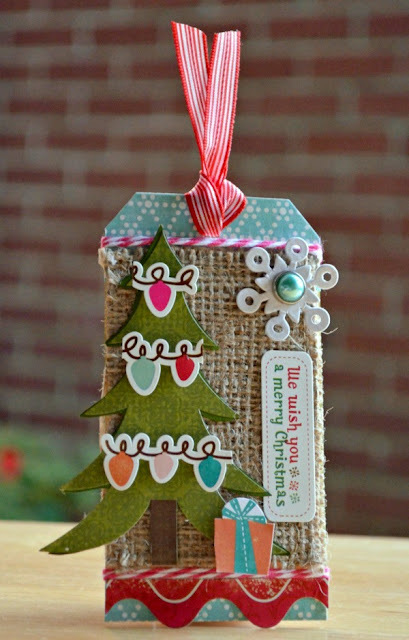 The tree detaches and can be hung as an ornament. 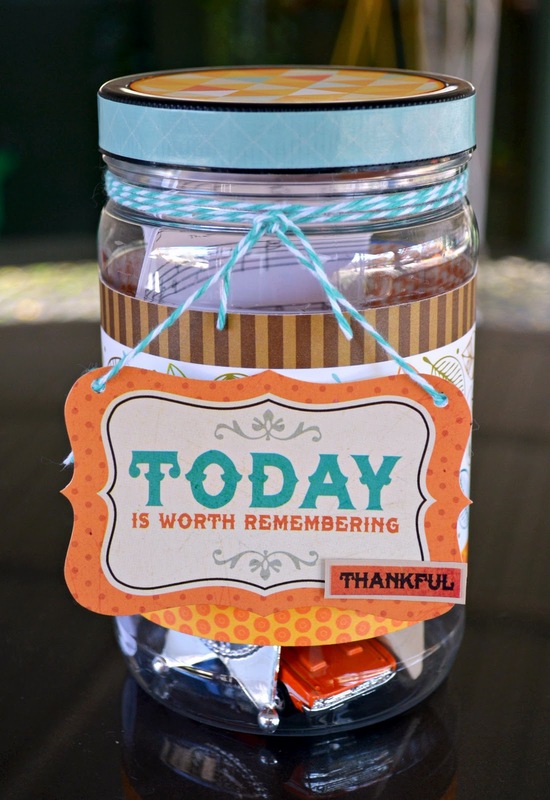 I used a brad to make the sentiment a swinging element. 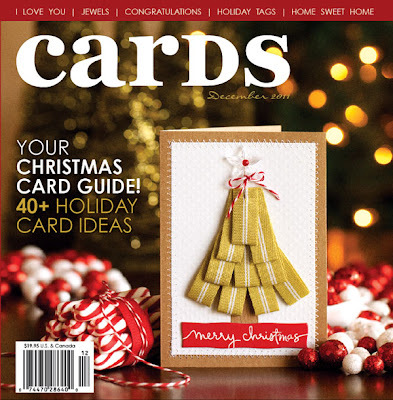 You can push the title in toward (and under) the tree to better fit the card into an envelope. To detach the tree, pull gently at each corner and hang as an ornament. Be sure to follow the blog hop list below and leave a comment on each person's blog. Finish up at the Echo Park Paper blog with a final comment. THREE winners will be selected to win a collection kit of their choosing. Comments can be made through midnight MST today for a chance to win! Winners will be announced on December 8 on the Echo Park Paper blog. I’m having such fun with my December Daily and have surprised myself with just how much I am enjoying this process. It makes me smile to mark down a little something each day. Life with a toddler seems to pass by in a blur and it’s really refreshing to pause and reflect on the day. Day 1 is the only entry that isn’t a two-page spread. 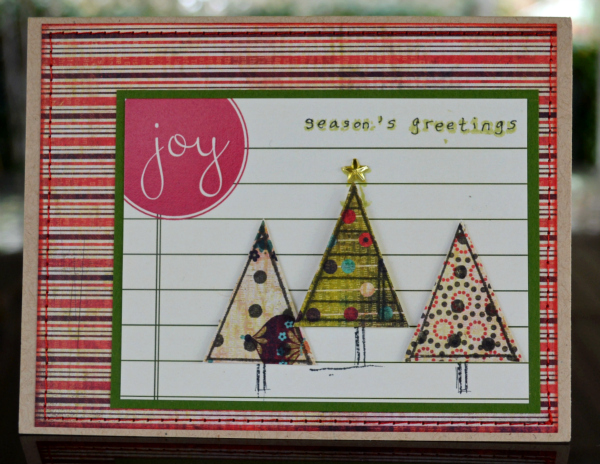 Here I wrote a little note to welcome December and to say how much I’ve always enjoyed the holiday season. I added this little pic through our window from the outside looking in to literally give a peek at our life. 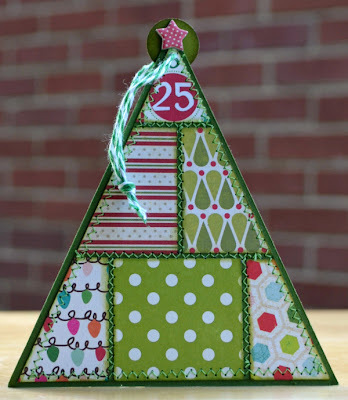 Day 2 tells the story of being just a little over-ambitious with the Advent calendar. My son, who’s 2, love blocks and puzzles and I thought the Lego City advent calendar would be right up his alley. Sure, the box said it was for ages 5 - 12 but I thought, how hard can a Lego project be? Um, turns out, pretty hard! Definitely not suitable for a 2 year old. I could foresee a meltdown every day: his and mine! So, we boxed that baby right back up and went to plan B. (See Day 4 for more on the story). On Day 3, we went to the annual Christmas luncheon at church. I used the program as my page insert. It was a little too narrow, so I added a bit of pp down the side. On the right, I wrote down who sat at our table and journaled about the program. I added a couple photos I took with my iphone, including one of Cory outside on the swing set afterwards. By Day 4, I had found a good alternative to the Lego advent calendar. Now, a small stuffed mouse and some candy canes are marking the passing days. This calendar is from 1987, I believe, and is one my Mom used when my youngest siblings were tots. I looked online to see if I could find more information about this specific calendar, sold by Avon, and was astonished to see several sellers on ebay asking more than $100 for this “vintage” item. If you have a December Daily, feel free to link yours in the comments. I'd love to see it! It’s December and I am so happy to welcome in the holiday season. Today, I officially start my December Daily and my little one opens the first door of his Lego Advent calendar. 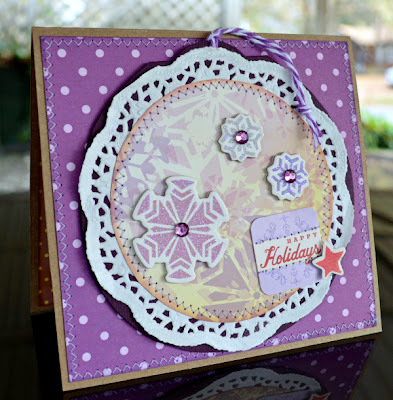 But first I want to share that I am a guest designer this month for Scraptastic Club. It’s a great kit club that gives you a choice of two kits each month. Both kits have great add-on options too. You can find the kits here. I chose the Naughty or Nice? kit. Here’s my first project. I scrapped a photo of my Dad with my brothers on Christmas morning. I love this Crate ornament paper. I pop-dotted some of the ornaments for dimension then set off the paper by adding borders punched from cream cardstock down either side. The large green die cut is Bo Bunny and it had a blue scallop design around the perimeter, which made the die cut too big for my design. So, I cut off the blue and stitched a red frame to ground the die cut. 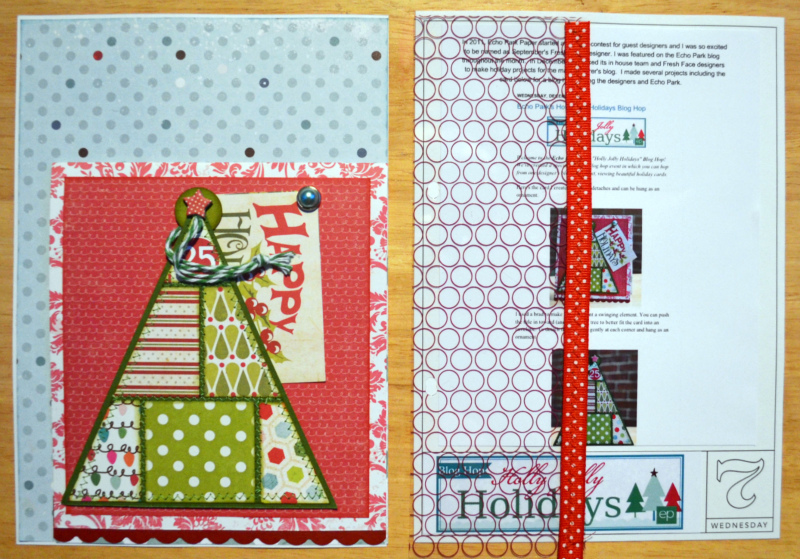 On top, I added a tag using a cute reindeer stamp from Imaginesce and alphas from Lily Bee. Scraptastic Club sponsors challenges each month with great prizes. Come play along. The first challenge is to use border punches and you have until Dec. 31 to upload your entry. 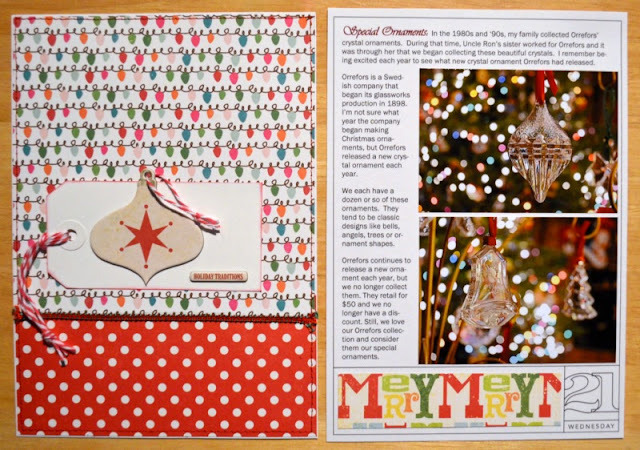 The prize this month is the Random Collection from Crate Paper. Oh, I love that line! 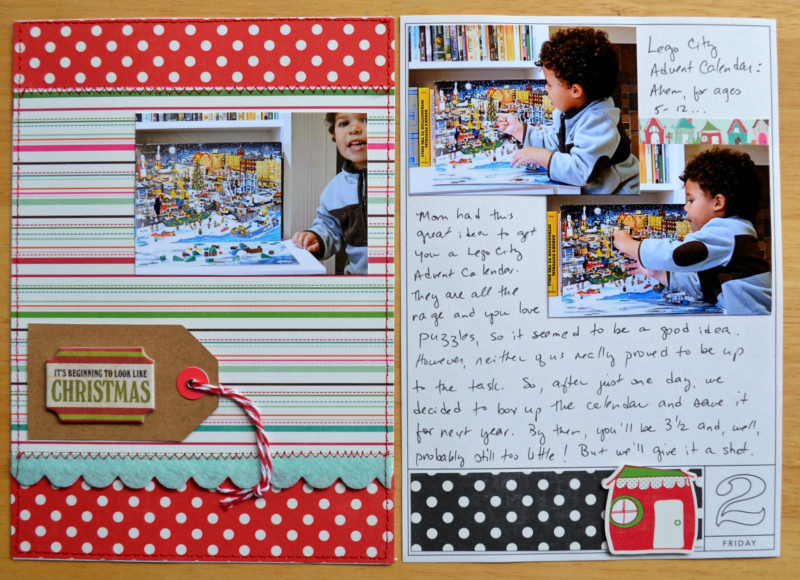 You can find the challenges on the Scraptastic Club Blog here.